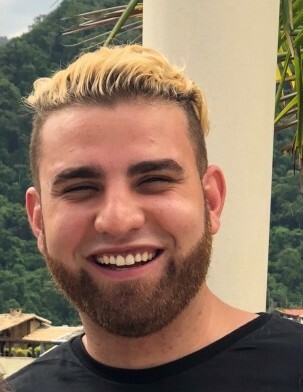 Framingham- Kevin Luiz Pereira Assis, 26, of Framingham died at home Friday February 8, 2019. He was born in Framingham, the beloved son of Luiz C. and Maria A. (Pereira) Assis and was a graduate of Framingham High School Class of 2011. He attended Mass Bay Community College. Kevin worked for Any Fence Company and for his brother’s company Cruz Solutions in Framingham for many years. While in high school he played football, soccer and lacrosse. Kevin loved fishing, canoeing and skating with his family. He loved his family and cherished their holiday parties. Kevin was always the life of the party, had a huge heart, loved making people laugh and above all, regardless of everything, always took time to help others. He leaves his parents Luiz and Maria Assis of Framingham with whom he lived; his brother Tony T. Cruz and his wife Jennifer of Framingham; two nephews, Levi and Luiz Antonio Cruz of Framingham; many aunts and uncles including, Ademar and Angela Ferreira, John and Vilma Lawrence, Edesio and Rita Andrade and Floriza Pereira; many cousins including Hiago and Katie Andrade, Thiago and Elen Pereira, Leandro and Carla Prado and Erich and Sarah Ferreira; his godparents, Maurico and Lilian Fernandes. Kevin’s family living in Brazil includes Sueli and Naugery Prado, Dirlene and Aurilio Pereira, Anderson and Michele Assis, Marlucia and Rogerio Pereira, Santiago and Sabrina Pereira and Eduardo and Viviane Pereira. Calling hours will be held Thursday February 14 from 9-11 a.m. in the Collins Funeral Home (www.CollinsFuneral.com), 378 Lincoln Street, Marlborough. A funeral service will be held at 11 a.m. in the funeral home. Burial will follow in Edgell Grove Cemetery, Framingham. All are invited to sign Kevin’s online guestbook at www.CollinsFuneral.com. Funeral arrangements are under the care and direction of the Collins Funeral Home.